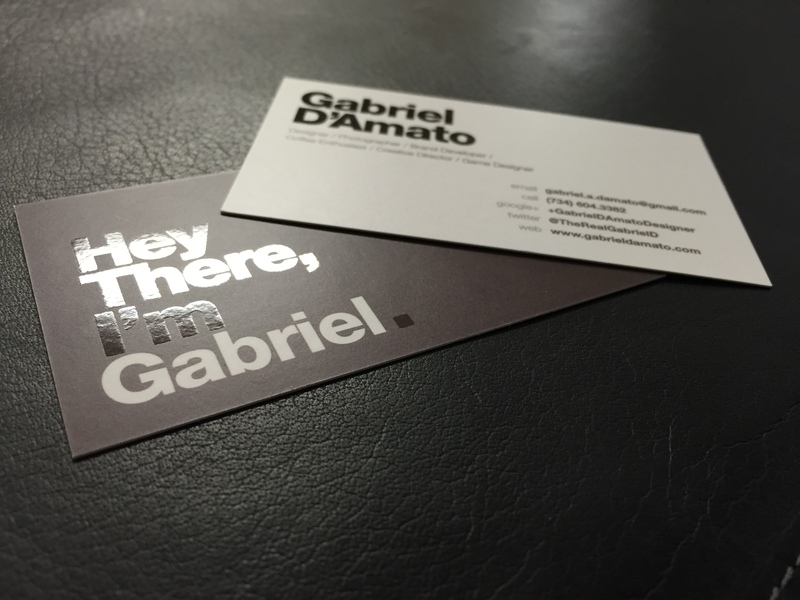 Why I (still) Love Business Cards – Hey there, I'm Gabriel. I still to this day love designing business cards. I don’t know what it is about that tiny little piece of paper that I get so excited to pick up, or hand out… but it gets me every time. Better yet, I love it when someone says “Can I get your card?”. Yes. Yes you most certainly can. Doing the business card design work for my clients is usually the first way for me to show them that I mean business (if I didn’t start with the website that is). I love design in all forms. Web, print, audio, animation, game… you name it, I love making it. However, nothing helps me really get a brand fleshed out like that standard 3.5″ x 2″ piece of thick stock. Most of my design clients don’t really understand that your business card is essentially your handshake, without you being there to shake that hand. Cards get passed around, and some people will get your card before they every meet you. It says a lot about who you are, what you are like, and what your company/business is all about. It shouldn’t just represent whatever your service is, and should absolutely not come from a freaking MS Word file. Best of all… business cards can be made with Spot UV for that extra punch. I can’t tell you how many people comment on business cards that take that tiny little extra step. Sure it costs a few extra bucks at the printer, and it takes a little more time to plan and design, but that is an investment worth making. So many businesses choose to take the cheap road on their business cards, and as soon as I get the card in my hand all I can do is sigh and shake my head. “Merp” goes through my head, I look at the person who handed it to me and ask “…who did your design and print work for this card?” By asking that simple question they immediately know that I know they went cheap. Not a great feeling for a business owner to have when talking to a guy in a suit. I will say this though, after asking such a question and handing them MY card, there is an 80% chance that I just got a new client. It’s the old “you show me yours, and I show you mine” trick (which is not as pervie as it sounds, I promise). More often than not, these owners just didn’t know what options they had, and had no idea that having an actual designer make the card and handle the prints makes miles of difference. That being said, don’t email me and ask for a business card design quote unless you have a reasonable budget in mind. These little bastards take a lot of time and effort to create (at least the GOOD ones do), and that time does not come cheap for designers. Here’s a tip: If a designer offers to make your business card for $100 bucks, leave. Leave immediately. Don’t even pick up your fancy water bottle or whatever you happen to be holding. Designers that sell themselves “cheap”, are not doing you any favors. The only time I use the word “cheap” to a client is when I am doing a comparison of paper/stock types. Certain papers feel cheap, certain ones don’t. I will let you take a guess at which one I recommend. Previous PostPrevious Where should you put your money when buying a new DLSR?